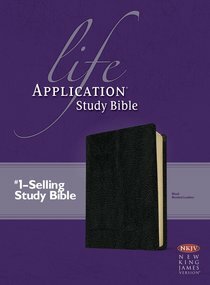 About "NKJV Life Application Bible Black (Red Letter Edition)"
Translate Scriptural truths into practical action. This study Bible is filled with practical notes with insights for godly living. You'll also find character studies to help you learn from the experiences of key figures in the Bible, a dictionary/concordance, book introductions, maps, charts, timelines, and more. Updated and expanded with hundreds of new notes and features! Nearly 10,000 Life Application Notes and features help explain Gods Word and challenge you to apply its truth to your life. Benefit from the life experiences of the best-loved and most-despised characters in the Bible inlt;i>Learn From Their Lives." Gain a deeper understanding through the vital statistics, overview, and timelines. Understand major themes outlined in short studies at the beginning of each book. Discover each book at a glance by exploring the outline and brief descriptions. Visualize the Bible lands and trace the journeys of Bible people with over 200 maps and over 260 charts right alongside the text. Find passages quickly through the helpful Topical Index. Enhance Your Ministry with the all newlt;i>Christian Workers Resource." Extensive Dictionary/Concordance, helpful indexes, daily reading plan, and words of Christ in red all support your growing faith. Free iLumina software inside!